Originally published under the title "Follow the Money: The Israel-Boycott Movement and Its Accomplices." 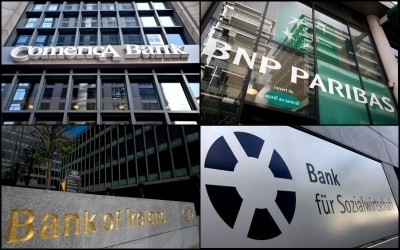 Comerica joins banking giants BNP Paribas , Bank für Sozialwirtschaft, and the Bank of Ireland in having closed accounts belonging to BDS organizations in the past year. Dallas-based Comerica said in May that it closed the account of the International Association of Democratic Lawyers, also known as IADL, due to a "business decision." Texas Gov. Greg Abbott's signing into law of an anti-BDS law in early May set the stage for the shutdown of the anti-Israel organization's account. Months of local and national pressure played a role in Comerica's calculus. 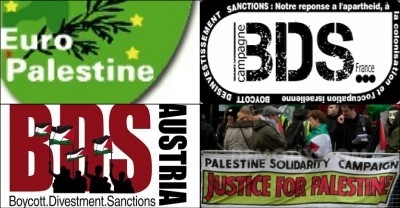 In contrast to Europe, anti-BDS account closures have not taken place en masse in the U.S.
Groups such as (clockwise from top left) CAPJPO-Europalestine, France BDS, the Palestine Solidarity Campaign, and BDS-Austria have been forced to move their money. Banks increasingly risk great reputational damage by providing accounts to BDS organizations. Benjamin Weinthal is a fellow at the Foundation for Defense of Democracies. Asaf Romirowsky is the Philadelphia-based executive director of Scholars for Peace in the Middle East and a fellow at the Middle East Forum.